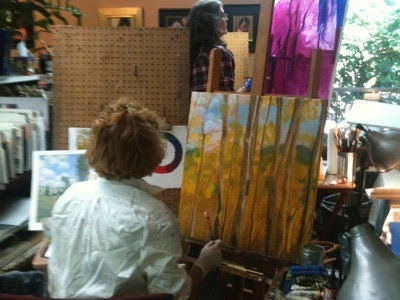 At this point you may be wondering if you are going to be able to learn to draw and paint. Is art for the selected few with “talent” or can anyone join in the fun? I don’t mean to say that there isn’t such a thing as talent. There is but talent isn’t necessary to be successful in art. People with less talent and more desire will go further than those with talent and no desire. The Los Angeles Times printed an article that concluded in a five year study of the nation’s top artist, athletes and scholars, it is drive and determination, not great talent, that lead to their extraordinary success. Perceptual skills of drawing are all teachable. What is not teachable is creativity. Creativity is innate. However, by learning the basics of seeing as an artist sees, you can lay down new pathways in the brain through which your creativity can flow out, so you can express your own unique sense of beauty in your own totally unique way that feels right to you. Creativity, aesthetics and personal style are already here. The way you dress, decorate your home shows your taste, and it is very personal. There is no right or wrong to it. It simply is your style. It is what you love. I good teacher can help you bring forth and develop your personal style, but you do the work. You unfold yourself, you discover who you are, and you say what it is you want ot say, in the way you want to say it. You make your own choices. The more skill you have to ground you, the more freedom you will feel to fly high. You’ll feel more certain of yourself and that confidence builds courage to go beyond your previous limits. First build a strong foundation, then get curious and discover what wants to be expressed through your art. Anyone who wants to can learn these skills. It is my sincere wish for you to know and experience fully the wonder and delight of your own beauty and true artistic creative Self!